I enjoyed my week of being home with just Will Holden. We had a lot of fun together and I got a lot accomplished. Last Tuesday, a blog friend who I had met once was in town and we got to meet up for lunch. It was a very fun visit. She moved this week to a state up north so I'm glad I got to see her before she moved. Wednesday morning, I packed up Will Holden and we headed to south Arkansas to pick up his sisters. It's a six hour trip. Will Holden took a nap and woke up around Arkadelphia where I went to college. I will take any excuse to drive around my alma mater. So we had a picnic lunch and walked around campus a little. It was so extremely hot that we didn't walk far though. 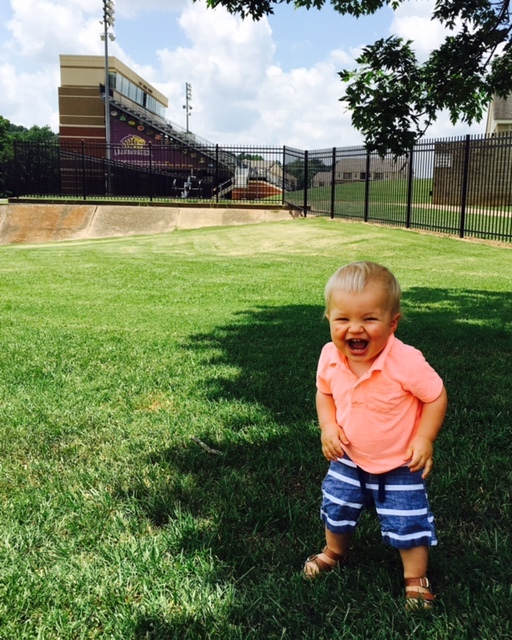 I took a picture of Will outside the football stadium (It's a small school). Maybe he will play football here one day. Or maybe he won't. ha! He doesn't look thrilled in this picture but I'm sure he will be happy to go to OBU one day! 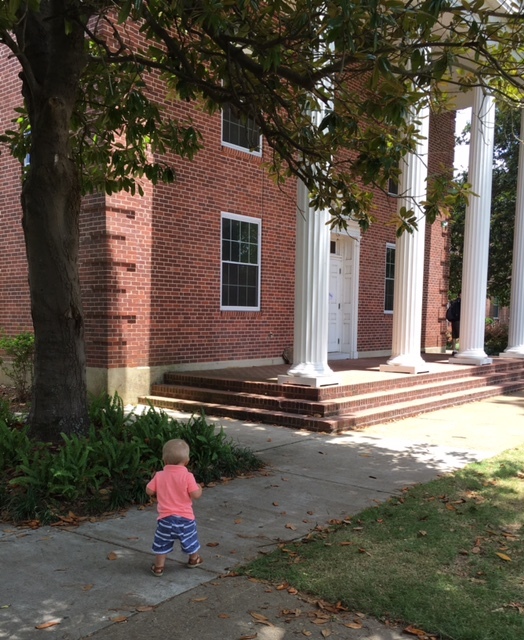 I love this picture of him walking in front of the Bible building/chapel on campus. This is a special building and although I would love to see Will Holden be a doctor or business professional or an athlete - my biggest prayer and desire as his mom is that he would love God's word and would live his life to have a passion for Jesus and for loving others. We were so happy to see our girls and they were pretty happy to see us. They had the BEST time with their grandparents. My best memories are the weeks in the summer I would spend with both sets of my grandparents. I'm so thankful my girls are building similar memories. They played on this water slide and fished and just had a lot of quality time with their grandparents. Thursday morning the kids and I set off to drive to Dallas. My niece turned four over the weekend and we wanted to go spend some time with her. My parents met us there and stayed at the hotel with us which was a HUGE help to me. We had a great dinner with my brother and SIL Thursday night. They all went to eat ice cream after and Will Holden and I just basically ran around outside. He was wired up and didn't go to sleep until 10:30 that night. I forget how hard it is to be in a hotel with 3 little kids. My niece had swimming lessons Friday morning so we hit up a mall in Frisco and took the kids to the Disney store and the lego store. My kids acted like they had never seen a mall. I guess it's been a few years since we have actually been to one. We have an outdoor mall here that we have only been to maybe twice but never an indoor mall. I don't know if that's weird or good. But they were easily impressed. Except Will Holden - he pretty much hated it. My cousin Molly is getting married next month in CA and we aren't able to go but we got to get together with Molly and my aunt and uncle and cousin Jackson and visit a little Friday. It was good to see them. My brother cooked for us that night and it was so good. He's a major foodie and an excellent cook. Saturday morning we went to the American Doll Store. It was an unplanned visit but so fun for the girls. Although we went it with very specific instructions of "we are just here to look - not to buy". ha! We have been working on doing chores and earning money and I told them they could look for what they wanted to work towards. Will Holden was not thrilled to be at AG. Or maybe it's the pink (and super dirty - yikes) stroller. ha! Saturday afternoon we had my niece's party and then a big dinner with all my SIL's family and mine. We had the best time. We loved our trip to Dallas! It was excruciatingly hot. There are so many things we could have done for fun but we mostly just wanted to stay inside near air conditioning. We left Sunday morning and headed home. It was good to be home. And now we are in the midst of VBS!! !